Art Harvey was a a model simulator running repetitive mathematical tests to see if any of these projects would work. 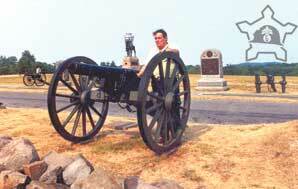 His preoccupation with simulation made him a most formidable opponent in leisure time activities when he,for example, calculated the most advantageous artillery shots in SPI's mammoth Gettysburg simulation "Terrible Swift Sword" or Rickey Henderson's devastating effect on pitchers in 1990. His handling of Mongol Armies in WRG miniatures 7th edition was terrifying and the best my Assyrians could ever do was cling to a desperate stalemate as his cavalry evaded my chariots and wheeled into an exposed flank, where ever it might be. My relationship with my father, Art, in the 1960s and 70s suffered from strains similar to that of other children whose parents had Top Secret clearances. I had no idea what dad did for a living. I knew he worked for Westinghouse as an engineer around aircraft, but he simply did NOT talk about it. When school teachers assigned the class to write reports about their parents' careers, I almost alwayswrote about my mother, who was a teacher. My father's response, "I am an engineer, but not the type who drives a train," was cryptic and insufficient. Colleges at the time were not full of students training to be electrical engineers and almost all who entered the profession came out of math departments, so there were no contemporary examples to which I could relate. My mother once threw me into confusion when I bought an old Janes U.S. Aircraft book and she put checks by all of aircraft that she helped design, nearly half of the modern jets. Her contribution was recorded in the movie "Minerva's Machine" but even she was quite about her former career. Westinghouse family day near Friendship Airport, later BWI, now Marshall airport was so uninteresting that anyone but the very curious and motivated would remain clueless (that is how I thin we won the Cold War, Soviet agents were so bored that they slept through all of the important information). I understand that children of naval designers whose parents worked at the David Taylor Model Basin near Washington, D.C. were treated to wave machines, model ships and simulations. Westinghouse children were treated to rubber bands dipped in liquid nitrogen and broken with a hammer. Fascinating the first time, but not after 20 years. Sorry I did NOT save any of the rubber bands. 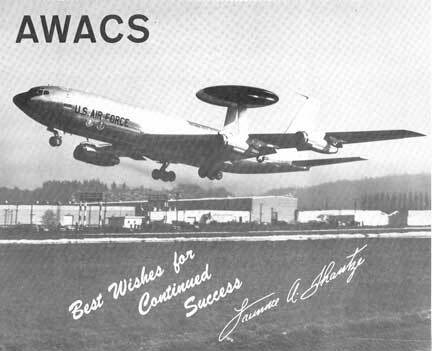 There was of course the Airborne Warning and Control System (AWACs) later called the Sentry, one of the best warning systems of the Cold War. That was common knowledge, but a giant radar mounted on top of a passenger jet was hardly eye candy. 8x10 picture suitable for framing given to employees of the project. Note that is larger than most family photos that engineers would have on their desks. All of this modest secrecy changed thanks to the Israeli air force. I remember buying the Strategy and Tactics game "Foxbat and Phantom" (designed in 1973, I probably bought it 1976) and I played it with Art. After several dogfights he discussed the game with a co-worker. He came home from work and said, "I spoke with one of my co-workers and asked him, do you think any of these aircraft can actually hit each other? He said he was convinced that they would have to turn off their missile systems and shoot each other down with cannons and machine guns." Now there's a vote of confidence, but as I would later discover it was his job to be skeptical. Art was addicted to simulation, he loved games especially those that simulated military combat and sports. It all became clear when the Israelis destroyed the Osirak nuclear facility near Baghdad on June 7, 1981, with among other things an F-16. Art came home late that night after drinking as he never did, and in a boyishly happy mood. He woke me up, to talk about nothing in particular. 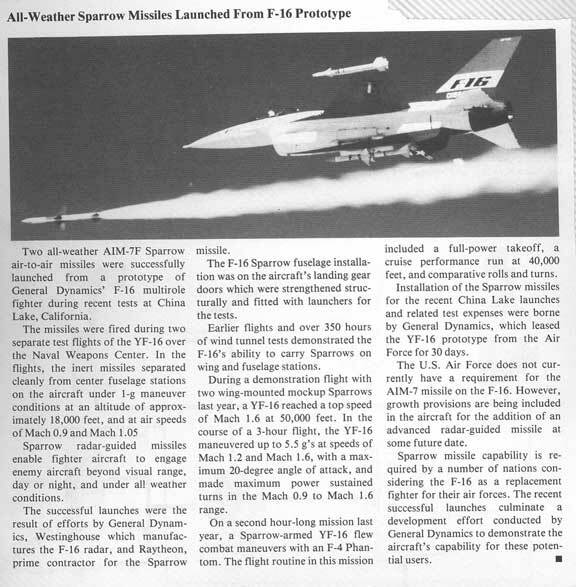 I was well in to my "Dad leave me alone" teenage years, but it didn't take me long to figure out the one big news story, and whose radar guidance system might have helped in the success of the mission. 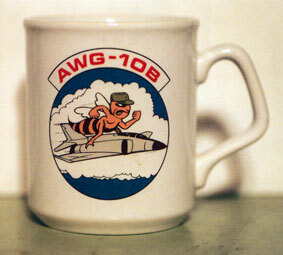 Before long a series of mugs started to appear on the shelves of our basement war room (Where we started playing SPI Napoleonics, then the U.S. Civil War, Avalon Hill's Squad Leader and finally WRG ancient miniatures). I have preserved those mugs that were not destroyed by my brother's lack of coordination which sent the collection plummeting to the floor. Art was a more talkative about work after the Israeli raid, perhaps relaxed restrictions at work allowed this. One of his points at the time was the presence of a Red or mainland Chinese employee at work. "Whatâs the point of requiring all of us to be quiet when they have a Chinese communist working there?" Or perhaps he related more to an older son than a pre-teen child. He gave me patches, I sewed these to my flight jacket in the early 1980s and proudly helped clear many New York mosh pits displaying them. 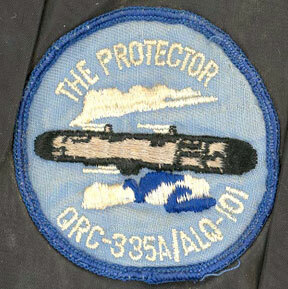 Here are the two patches that were given to me by Art Harvey in the early 1980s. 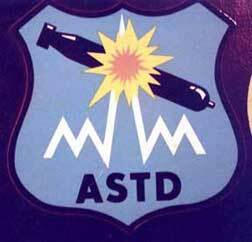 Both of them are from projects initiated and completed in the 1960's. I can just imagine him hanging on to these for 15-20 years before giving them to me. I had no idea what they were at the time and very little interest in knowing. 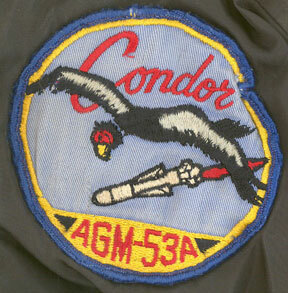 Loved the art work especially on the Condor. 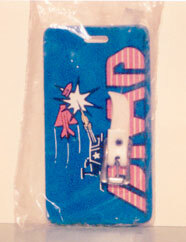 He also gave me promotional stickers that I unfortunately pealed and applied to a file cabinet. They refuse to come off. 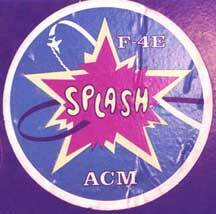 Here are the stickers, I know even less about these projects than the mugs and patches only that two of them are obviously F-4 Phantom projects, it is unfortunate that I applied them to a file cabinet, but it at least ensured that I wouldn't lose them over the years. It was popular in the early 1980s for defense people to criticize of Jimmy Carter and praise Ronald Reagan, but Art was alarmed by Reagan's spending policies. Cryptically as always he would often say said "You can't just throw money at a problem and make it work." 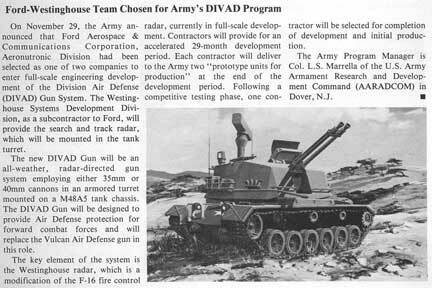 Later I discovered that his section at work had be assigned or won the contract on the M247 Sergeant York Division Air Defence Gun or DIVAD. 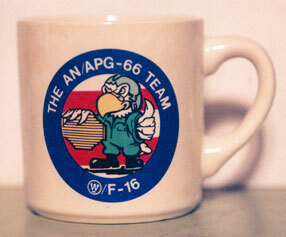 This consisted of twin 40 mm anti-aircraft guns mounted on an armored vehicle with the APG-66 radar used on the F-16. 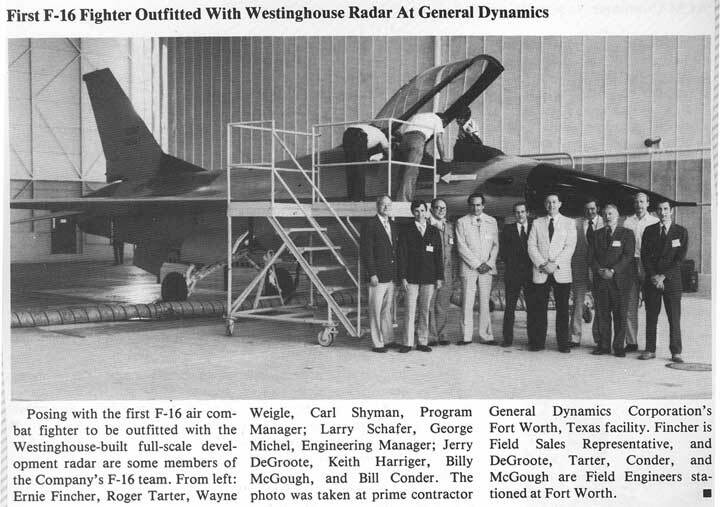 The engineers found it impossible to get a radar designed for air-to-air combat to work as a ground-to-air firing system, even as I recall if they linked it with AWACs. In the end it was a total disaster, 50 prototypes were made, it didn't work, and the cost of the project was in the billions. 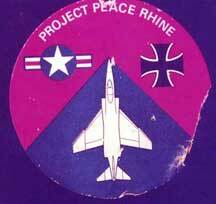 It is ironic that his section's success with AWACs and the F-16 set up the biggest failure, DIVAD. Art was not pleased with the failure and especially as I can only guess from his cryptic comments that his advice was not heeded. He became less passionate about military simulation but substituted it for something equally mathematic, computer baseball. His team, Big Blue, won championships from 1986 to his death in 1991. 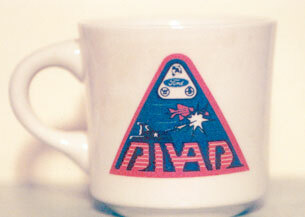 So it is also ironic that DIVAD provided more mugs and gear than any other single project. It is important to note that no one person "invents" any of this equipment in the modern era. History often tries to create a legend around a lone designer who invented systems, but teams and sections make these concepts a reality. I authored this memorial in part to credit the multitude of designers who spent thousands of hours developing these forgotten projects of the Cold War. This poster decorated the door to the war room for many years. It survived a number of basement floods and his a little mildew but i rescued it in 1991. 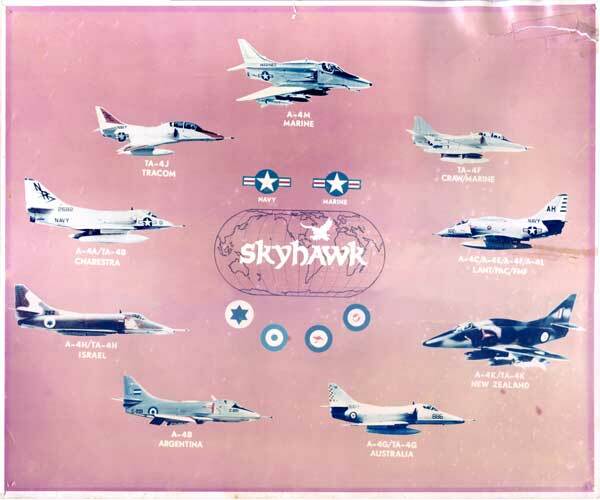 It has good photos of different versions of the Skyhawk (includes Marine, New Zealand, Argentina and Israel).